The habit of over-indulging during the winter months presents a problem when it comes to our waistlines. It is normal to put on a few pounds in the winter, but we want to avoid putting on any more than the obligatory “winter five.” We should use this short break from our hectic social lives to our advantage. The fact that New Yorkers stay indoors more often during the winter and eat out less is definitely something to work with. It may take slightly more preparation, but cooking is healthier and more economical than dining out anyway. Use the winter as a time to brush up on cooking skills and try out some healthy recipes. Look at cooking as a fun indoor activity—this way it won’t seem like such a daunting task. Everyone is so busy during the week, so it is surely beneficial to prepare some healthy meals over the weekend to keep in the fridge. This way, you have a few “go-to” meals to heat up right away after work. This means fewer take-out meals, which tend to be more caloric and definitely more expensive than cooking at home. It’s a win-win situation for both your waistline and your wallet! I recommend preparing meals that can be made in large quantities and stored in the fridge, such as a big pot of lean turkey meat sauce, bean soup or vegetable stir-fry with brown rice. Try to avoid starchy vegetables. Always include 1 or 2 non-starchy vegetable on your plate such as broccoli, spinach, kale or asparagus. Non-starchy vegetables are high in fiber, which will help keep you full and satisfied for longer periods of time, without providing an abundance of calories or fat. If you are not into cooking, “breakfast for dinner” is always a great option. Make scrambled eggs with vegetables and a side of wheat toast, a bowl of oatmeal with berries or an egg-white omelet with low-fat cheese and avocado. It is also important to note that point out that sweetened hot beverages are not necessarily your friend. These beverages are extremely high in sugar, which is eventually stored as fat in the body. Avoid one of nutrition’s cardinal sins and please refrain from drinking your calories! If you are in dire need of a hot chocolate or latte, make sure it is made with skim or low-fat milk and sugar-free syrup. If you own a Keurig coffee machine, try out the hot chocolate, latte or unsweetened flavored tea pods to take with you in a to-go cup. These pods contain less sugar and calories than any store-bought beverage and are just as satisfying, not to mention, much more cost-efficient. Excessive ordering-in is a main culprit of winter weight gain. It is impossible to know exactly which ingredients restaurants use to prepare our meals and the majority of the time, take-out food contains more calories, fat and sodium than we think. Preparation is essential to staying on track and avoiding weight gain during the winter months, when it is inevitable that we are less physically active. On that note, it is important to incorporate even a small amount of exercise whenever you can, to maintain muscle strength and tone. Keep a set of hand weights in the closet to use when you are watching television or waiting for dinner to cook. Any small amount of exercise can make a significant difference! Love is certainly in the air when February arrives…and so is chocolate! Valentine’s Day is up on our holiday checklist, which signifies many “I LOVE YOUs” and even more chocolate and sugary treats. If you haven’t noticed, Valentine’s Day candy has been on store shelves since early-January. More than a month before the actual day! This makes it easy for consumers to purchase candy early and leave it sitting around their kitchen as an unnecessary temptation. Although one of the perks of Valentine’s Day is receiving candy and other sweet snacks, it is important to be mindful of the excess sugar that these treats contain. Keeping that in mind, there is no need to completely boycott candy and chocolate this Valentine’s Day. We just need to indulge in a way that won’t undo all of the hard work we have done throughout the year. Mini- Muffins: Whether chocolate chip or blueberry, mini- muffins are the perfect treat to satisfy any sweet-tooth. They are not only delicious but also filling (which is more than we can say about a chocolate bar)! You can bake them using whole wheat flour, which can add extra fiber as well as low-fat milk and margarine to cut back on calories from fat. Chocolate Pudding: Pudding is the perfect treat for any chocolate lover! It is low in calories and very satisfying. Also, try adding low-fat cool whip or whip cream for some extra zest! Pudding comes in many flavors such as vanilla, caramel and tapioca so it is a great and healthy option for those who crave variety. Hot Chocolate: Everyone loves a cup of hot chocolate. For a rich- tasting, but still low- calorie cup of cocoa, mix a cup of low-fat milk with sugar-free cocoa powder or syrup (can add in a Splenda to sweeten if needed). This sweet treat is so low in calories that you can even have seconds! Chocolate Protein bar: Pick a bar that has up to 160 calories. You’ll get the benefit of the protein and fiber while enjoying a sweet snack. Although Valentine’s Day is a time to spread the love, it doesn’t mean we have to over-indulge. Like on any other special day, it is okay to treat yourself to chocolate or other candy; however the key is to be mindful and not go to extremes! Wishing you and your loved ones a Happy and Healthy Valentine’s day! With 2016 upon us, it’s time to kick those resolutions and positive goals into high gear. A common resolution we all hear from our friends and family is the desire to become healthy and more active in the New Year. We all know how this one goes. The first week or so goes well with a strong dedication to eating well and working out. However, a few weeks into January, it is easy to lose steam and fall off the “lose 10 lbs by February” wagon. That is why it is important to set realistic goals and expectations for the New Year and create an entire lifestyle change for you and your family. Don’t feel you need to change overnight- you have a whole year to meet your goals! Get active and enjoy it! : We all know how hard it is to make the transition from rarely exercising to hitting the gym full force after the New Year. This all-or-nothing mentality is a sure way to lose motivation. Try an activity that you actually enjoy doing! It doesn’t even have to be at the gym. Try something new like a tennis lesson or daily power walk. This way, exercise will seem fun instead of like a chore. Start cooking more: Home-cooked meals are the healthiest and most well-balanced for your family. As opposed to a meal prepared at a restaurant, you are in control of the ingredients you use when cooking in your own kitchen. For instance, restaurant chefs use high quantities of butter, salt and other caloric ingredients when preparing your meal. Start the year off on the right track by making the effort to cook more meals at home for you and your family and include the appropriate portions of proteins, vegetables and carbohydrates. Cooking at home a bit more frequently will make a significant difference in how you look and feel! Plan Ahead: Snacking is not a bad habit! However, it is important to always be prepared with the right kinds of healthy snacks to keep you full and satisfied in between meals. Portion out single servings of healthy snacks such as nuts, protein bars, soy chips, and fruit in order to prevent overeating at the next meal. Sleep, Sleep, Sleep! : It seems unrealistic to get the suggested 8 hours of sleep per night. However, getting the appropriate amount of sleep each night is crucial to maintaining a healthy and balanced body and mind. Despite your hectic schedules, make an effort to have a regular sleep cycle. You will feel much better! Happy (and Healthy) Memorial Day! 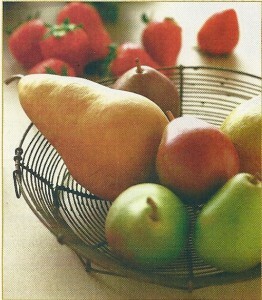 Spring signifies that fresh fruits and vegetables are in season! Stock your refrigerator with tons of vitamin-filled and antioxidant-rich fruits and vegetables to snack on. Celery with peanut butter, carrots with hummus and cherry tomatoes with laughing cow cheese are low- calorie, delicious snack options that everyone in the family will enjoy. Want to have your cake (or pie) and eat it too? 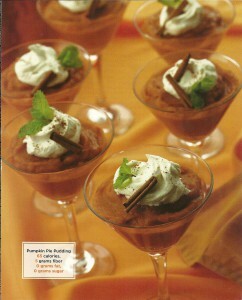 This recipe for Pumpkin Pie Pudding affords you all the flavor and richness of pumpkin pie, minus the sugar and fat. It’s very quick and easy to prepare, and requires no cooking skills or fancy equipment—just a bowl and a spoon! Pumpkin also happens to be an excellent source of fiber and beta-carotene, so this dessert is actually good for you! Enjoy! Combine all ingredients (except garnish) in a mixing bowl and beat for about 1 minute, or until smooth and well-blended. Spoon into dessert dishes and refrigerate at least 30 minutes before serving. Garnish with mint leaves and whipped topping, if desired.